Who for – Suitable for higher risk areas and larger populations. 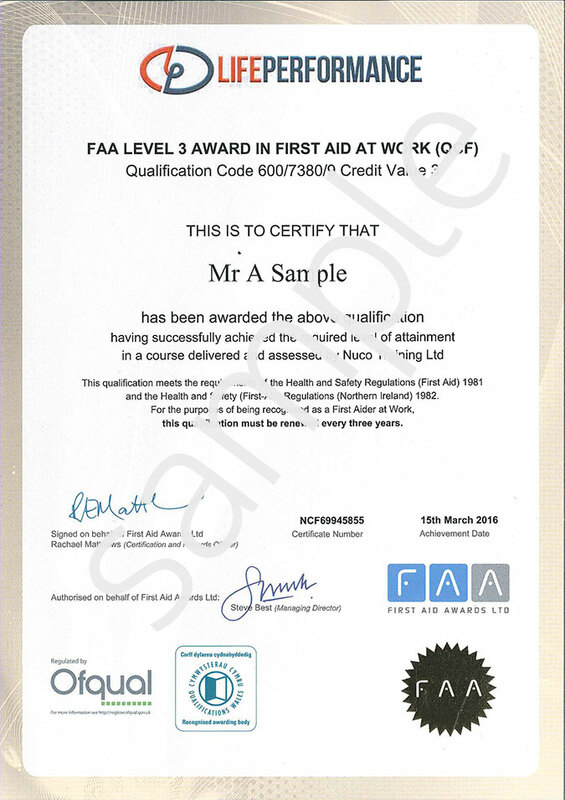 First Aid at Work satisfies the requirements of the Health and Safety Executive (HSE). This course will give the participants a qualification to the highest level of First Aid, meeting the statutory requirements of the Health and Safety (First Aid) Regulations 1981. Duration – 18 classroom hours, ideally over 3 days, however we can accommodate specific needs providing the course is complete within 10 weeks. Acts and regulations, first aid provision, responsibilities, scene assessment, hygiene, first aid kits, reporting, casualty priority, primary and secondary assessment, unconscious casualty, airway management, top to toe survey, recovery position, cpr, defibrillator training, choking, shock, fainting, bleed control, amputations, epilepsy, asthma, heart attack, angina, diabetes, stroke, open fracture, closed fracture, support sling, elevation sling, spinal injuries, head injuries, concussion, compression, skull fracture, sprains, strains, dislocations, bruising, chest injuries, abdominal injuries, crush injuries, electric shock, anaphylaxis, poisoning, burns, chemical burns, hypothermia, heat exhaustion, heat stroke, eye injuries, embedded objects, splinters, bites stings. Child and baby first aid techniques. Summative practical assessment is ongoing by the instructor each day, along with a written assessment on each day. A three year Level 3 Award (Level 6 in Scotland) in First Aid at Work will be issued to the learner, subject to successful assessment. Price – £185 per person / £1000 for groups of 6+.